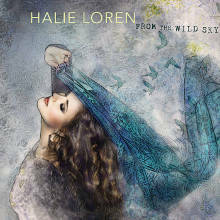 George Graham reviews Halie Loren's "From the Wild Sky"
Jazz-influenced women singer-songwriters have been something of a trend in recent years, inspired with the popularity of Norah Jones back in the early 2000s. The field is fairly wide with artists running from more straight-ahead jazz to rather electric. Some do mainly the compositions of others, with a limited amount of original material like Lizz Wright or Cassandra Wilson, while others concentrate on more on their songwriting like Becca Stevens. This week, we have a new recording from interesting artist who has done albums in both ways, with some cover songs, and some originals. This time, it’s a new recording of almost all originals with some creative arrangements. It’s Halie Loren, and her new ninth album is called From the Wild Sky. Halie Loren spent much of her childhood in Alaska, before later settling in the Pacific Northwest. She began to attract attention at an early age, being considered something of a prodigy winning a national songwriting contest at age 13. By age 19, she had moved to Nashville to be part of the scene there. She recorded her first album at age 20 in 2006, featuring all original music. In the meantime, she has attracted attention in Canada and Japan, where her records have topped jazz charts. Indeed, after her first recording, she usually included a jazz standard or two on subsequent releases, such as her 2015 release Butterfly Blue, which we featured in this series. Her new release has the most original compositions since her debut. The new album also features different personnel from her last album, and was recorded partly in London, partly in New York, and partly in her home base of Portland, Oregon. Like many singer-songwriter records, a lot of effort was put into the lyrics, addressing mostly relationships in various states, but the compositions reflect her jazz affinity with interesting arrangements and often shifting time signatures. But the overall sound can borrow from contemporary pop at times, and at others feature interesting instrumental textures including some ukulele, chamber strings, and a little electronica. Ms. Loren’s jazz background is also apparent on her vocal style on several of the tracks. She is joined by a small grounp with Michael Olatuja on electric bass, Ben Williams on acoustic bass, Troy Miller on drums, percussion and keyboards, and Femi Temowo on guitars. Ms. Loren plays some piano here and there and ukulele on one track, but she mainly concentrates on her vocals, which are as usual refined but cool. Halie Loren’s new album From the Wild Sky is one of her best yet. The Pacific Northwest based singer-songwriter and occasional jazz chanteuse has created a bunch of first rate songs that are as intelligent lyrically as they are creative and tasteful musically. Her jazz background is somewhat suppressed on this album in favor or more eclectic arrangements, but they imbue her songs with just the right sonic textures, which support her always appealing vocals. The one area where the album falls down is in audio quality. As usual, the problem is the recording being badly over-compressed to jack up the volume. While the vocals are reasonably well recorded, the percussion and low end sounds noticeably distorted on almost all the tracks, and that sometimes affects other instrumentation. And of course, that folly of trying to be world’s the loudest record destroys most of the dynamics, the ebb and flow of the performance. I find it gets hard to listen to after a while for this kind of subtle music. Halie Loren has been on the scene for over a decade now, and new her ninth release reminds us of what a gem she has been among the chanteuses.